The lawn of the Moorestown Community House was filled with residents and visitors on Dec. 7 as they awaited the 34rd Annual Tree Lighting Celebration. They had their traditional holiday musical performances, storybook reading for kids, hot beverages and snacks, Santa visit and, of course, tree and menorah lighting. However, this year was extra special, as the MCH had a fire in November that damaged the attic and affected other parts of the building, causing it to be temporarily closed. It wasn’t long after, the MCH received an overwhelming amount of support and was able to get a lot of its facilities running again. During the MCH Tree Lighting Celebration, Board President George Schulmann and MCH Executive Director Brad Kenney thanked those who helped during and after the fire, and residents for helping and being supportive of the town’s historic building. “I’d like to thank everyone for being here in celebration of the holiday season, the Community House and the saving of the Community House from the fire,” Kenney said. “This is what this building here is for, serving the community. And without you, this building wouldn’t be here,” Schulmann said. The Sun came to the MCH Tree Lighting Celebration to ask residents their thoughts on the tradition as well as their own holiday traditions. All around, residents really loved the MCH Tree Lighting Celebration. They felt it’s a great and wonderful tradition that brings the community together and gets them in the holiday spirit. “It starts the season. With the Moorestown Holiday Parade on Saturday and the tree lighting, it gets the kids really in the spirit,” Michelle Sullivan said. “It’s a wonderful event that really brings the community together,” Ann Chardo said. Residents were happy the MCH held the lighting despite the fire. The amount of support by people showed the dedication and endurance of the MCH and the community. “It shows the perseverance of the town and the support the MCH has and the town has in general,” Sullivan said. “I think the turnout shows how appreciative people are that it didn’t burn down,” Missy Roth said. 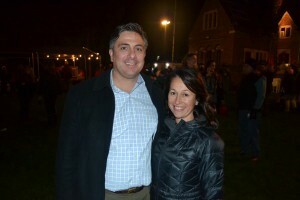 Newlyweds Ben and Leah Smith said it was their first time attending the tree lighting. They’ve always done the annual Moorestown Lions Club Holiday Parade, held on Dec. 5 this year, and learned about the tree lighting, so they decided to come and check it out. Leah grew up in a town where they don’t have any such holiday events, so for her, the Moorestown holiday events are special and exciting. “I grew up in a town where we didn’t do anything, and when I started dating him (Ben), I started doing the parade. I think I got more excited for it than he did,” Leah said. The Smith’s holiday traditions include the Moorestown Holiday Parade, Philadelphia’s Macy’s Charles Dickens and light show, and, now, the MCH Tree Lighting Celebration. Many residents have different traditions, but all spoke about spending time with family and celebrating together. According to Schulmann, people have been asking how they can help the MCH. He recommended visiting the Facebook page or its restoration campaign at www.ourcommunityhouse.com and donating there. “I can promise you that this building will come back stronger, better and more beautiful than ever,” Schulmann said.